BAGHDAD — Amira Edan, the director of Iraq’s National Museum, says that soon she will no longer have to worry so much that the famous institution remains closed to the public for fear of violence. He was addressing Iraqi officials, journalists and American Embassy officials, along with a platoon of bodyguards, gathered at the museum in a small conference room with a 50-foot-high ceiling. “I can think of no better use of our time and our resources than to make the images and the ideas of your civilization available to all the people of the world,” Mr. Schmidt said. Mr. Schmidt and his entourage, like the embassy officials, arrived at the museum in convoys of armored Suburbans, along with helicopter cover and snipers on neighboring roofs. Still, less than a quarter-mile away, cranes and backhoes continued to excavate the rubble around the ministries of municipalities and justice, which were destroyed by a suicide bomb on Oct. 25. The bombing also broke windows in the museum, and may have caused structural damage to its walls, Ms. Edan said. Mr. Schmidt, speaking after his brief address, said he did not believe digitizing the museum’s collection would undercut its ability to raise money later, as many museums do, by selling images of its treasures. Google’s efforts to digitize collections in libraries have provoked controversy and debate in the literary world. What no one at the event mentioned was that the National Museum’s collections had already been digitized, at least in part, by Italy’s National Research Center, under a 1 million euro grant from the Italian Ministry of Foreign Affairs. The collections went online last June as the Virtual Museum of Iraq. Ms. Edan said that Web site, also made with the cooperation of the museum, was not extensive enough, and that the Italians did not do everything that Iraqi officials had asked. 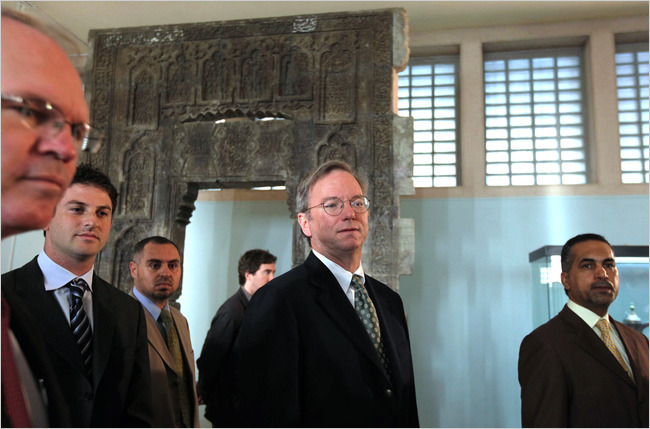 “This site is not sufficient,” she said, adding that she expected that Iraqi officials would have more control over the Google effort. Massimo Cultraro, scientific director of the Virtual Museum, said in a telephone interview that the Web site was a collaboration among 100 scientists, computer technicians and historians. Google’s plans, he said, are to digitize as much as possible of the National Museum; it’s not as if they have to worry about storage space. After the news conference, Mr. Hill took questions on Iraq’s present election-law crisis. There are fears that a vice president will once again veto the law, forcing a further delay in January’s elections.